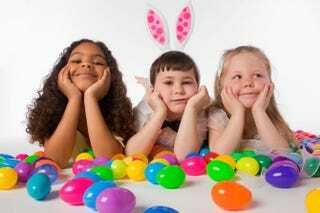 The kids were supposed to have fun hunting down the hidden eggs and unlocking the treats inside, but what some Virginia parents found rolled up in the plastic eggs was much more alarming, WRIC reports. According to the report, the Smith family was egg hunting with their 3-year-old son on Sunday afternoon in the West End when they found one of the offensive eggs. "My husband noticed the last Easter egg, and I knew it wasn't one [I] put out. We opened it and it's got the white supremacist stuff in it," Jackie Smith told the station. The family noticed several more in other people's yards and went around alerting neighbors so that other children wouldn't find eggs filled with messages like "diversity = white genocide … mass immigration and forced assimilation of non-whites into our lands is genocide." The eggs also included websites for the White Man March and White Genocide Project. "We don't want other kids around here who can read being like, 'Hey, Mommy, what's the Million Man White March, or what's the Genocide Project?' Most of us don't want to explain genocide to our 6-year-olds," Jackie Smith. "I think it’s absurd," husband Brandon Smith said. "Everybody's shocked. We are genuinely floored. Why would somebody do this? Why here?" Jackie said. "You can hit the whole world with the Internet—stay out of my yard."